As years go by, I become more and more like my … mother. What happened to me? I never cared for any domestic stuff, ever! I used to dread my chores as a kid: I always tried to pretend I was sleeping on Saturday mornings when my mom was getting ready to go to the farmer’s market, and I always tried to trick my sister so that I could skip my turn to water mom’s violets and lilies. But now something changed in me, and I started craving the smell of fresh fruits from farmers market, I started wishing to have my own farm or, at the very least, a garden. I wish I could have it already fully grown in my backyard! Last Saturday, as I was still lying in bed planning my journey of learning the ABCs of gardening, and, of course, becoming a pro, I could almost picture my ideal little garden. It would be a mixture of fruit trees, berries, flowers, and veggies, all mixed together in an orderly disorderly fashion. It would have a bench in the middle of wild flowers that would exhale a sweet summer smell reminding us of our lazy childhoods. I have to confess, I am not a very patient person when it comes to the waiting game. Last year Alex and I, with Varuzh’s help of course, made an attempt to grow a garden. We planted tomatoes, bell peppers, strawberries, and lilies. I was very excited to eventually harvest some crops, like six tomatoes, two bell peppers, four strawberries and nine lilies. But our garden did not look anything like I pictured in my mind. It was bare with two bushes, strawberries that were mainly eaten by the birds, and lilies that were too few and too far apart. Maybe I just don’t have a green thumb, I thought in disappointment. Now it’s another year! Spring is here, and I have to try again. But I will have to be smarter this time, and that is why I am willing to start with basics… like going to a garden store with someone who knows this stuff! I grabbed Alex and my friend Mary Ann who is also known in my world as a gardening pro, and we went straight to the source – the beautiful Rogers Gardens in Newport Beach. And what a pleasure it was for our senses! The beauty of plants in full bloom, cleverly coordinated by type and colors, mixed with flowing fountains, antique looking pots and cute little sculptures. The garden was designed in orderly disorderly fashion, just as I like it! As we walked on the gravel, Mary Ann showed me and Alex different kinds of plants that could work in our garden and that would not require much work – I’m sure she knows the color of my thumb. Even though I wanted to buy half of the garden plants, I kept reminding myself that I have to be patient and take it one step at a time. 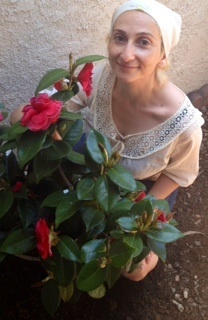 So I settled for a Camellia for its beauty, deep color and easy care. Hopefully, it will eventually grow into a beautiful tree under which I will build a bench and next to which I will plant lots of wild flowers. We dug a deep hole today and planted our new Camellia tree. It is a little small and a little bare, but I think it is very pretty. 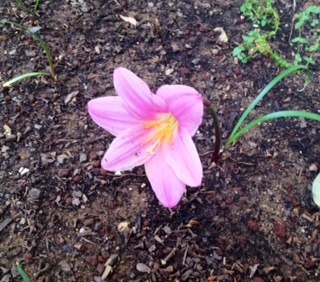 And as we were planting it, I noticed a lily that peeked through the ground.